The Blot was super pumped to learn Titan Entertainment has just announced an awesome new Titans Mini Figure Series based on the popular AMC television show, Preacher! 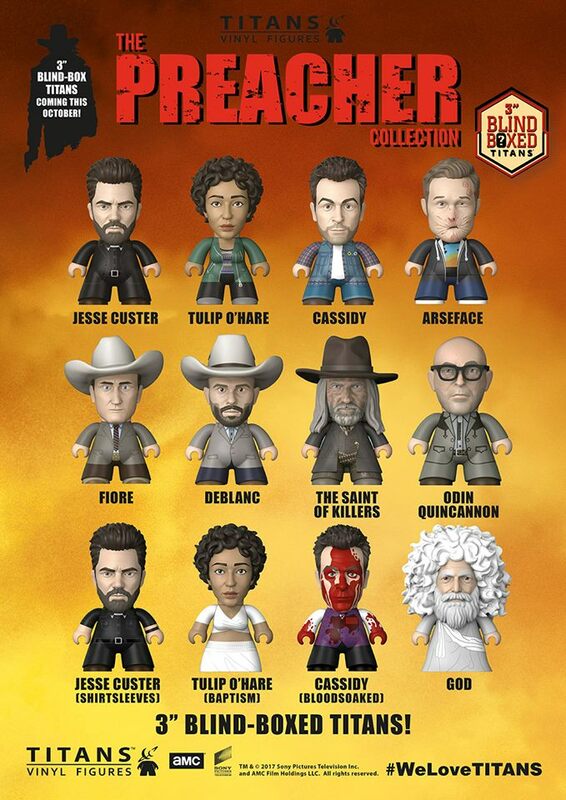 This debut wave of Preacher Titans 3” mini figure blind boxed series is based on season one of the pulse-pounding TV show starring Dominic Cooper, Ruth Negga and Joseph Gilgun, which in turn is based on the legendary DC Comics/Vertigo comic book series by Garth Ennis and Steve Dillon. The Preacher Titans Blind Box Series includes 3” mini figures of Jesse Custer, Tulip O'Hare, vampire Cassidy, Eugene “Arseface” Root, Saint of Killers, Odin Quincannon, Fiore, Deblanc, “Shirtsleeves” Jesse Custer, “Baptism” Tulip O’Hare, “Bloodsoaked” Cassidy and God. 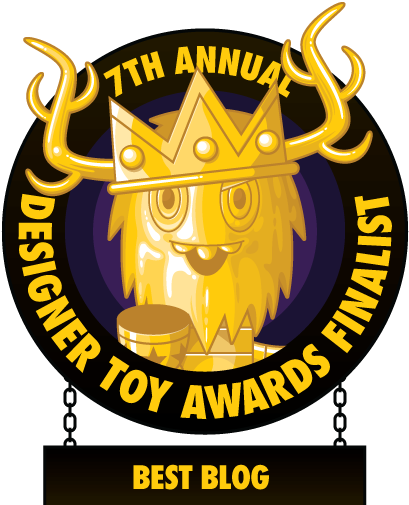 This series also includes 4 hiddne chase figures, one very rare 1:288 Super Chase figure and one incredibly rare 1:576 Ultra Chase figure. 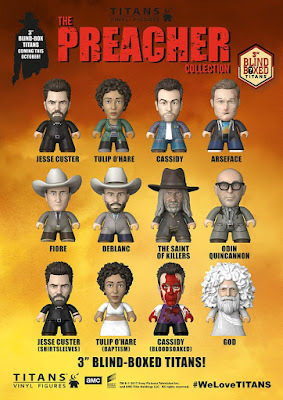 Collectors can pre-order this exciting new Preacher Titans Mini Figure Series now at Entertainment Earth, where you can buy individual blind boxes for $9.99 or a full case of 18 blind boxes for $179.99 here.